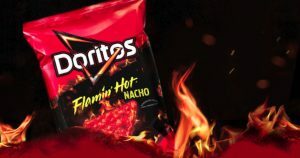 Kroger Doritos Flamin’ Hot Instant Win Game is giving away 7500 DORITOS tortilla chips! The "DORITOS® Flamin' Hot” Sweepstakes (“Game” or "Promotion") is offered only to legal residents of the fifty (50) United States (except FL, NY and RI) and the District of Columbia who are at least 18 years old at time of participation. Employees, officers and directors of Frito-Lay, Inc. ("Sponsor"), The Kroger Co., YOU Technology, LLC ("Administrator") and their respective parent, affiliated and subsidiary companies (including each of The Kroger Co. Family of Stores listed in Rule 3), advertising and promotional agencies and any individuals/entities involved in the preparation of materials, execution and/or administration of this Promotion (collectively the “Promotion Entities”) are not eligible to participate. Groups, clubs, organizations, commercial entities and businesses are not eligible to participate. The Promotion is void in FL, NY and RI and where prohibited or restricted by law. Participants must have a participating digital account tied to a participating Shopper’s Card which may be obtained without cost. During the Promotion Period, access Kroger.com/doritos ("Website") and sign in to your digital account tied to your participating Shopper’s Card (“account”). If you do not have an account, follow the instructions to register online or sign up in-store and then create an online account at your participating Kroger Co. Family of Stores retailer website. Creating an account is free. After signing in you will be taken to a landing page with instructions on how to play the Trivia Game for a chance to win a prize. The Trivia Game consists of four (4) separate trivia questions and, once all four are completed, will constitute a Game play ("Game Play"). Each Game Play will be considered one "entry." Although a response must be provided for each of the four questions (or, if time runs out, the correct response will be shown), responses do not need to be correct. Prizes are seeded by time of day, which determines whether or not a winning or non-winning message is displayed on the screen after a Game Play. If your Game Play is the first to occur at or after one of the randomly-generated winning times, you will be a potential instant winner of an instant win prize indicated in the Prize section below (“Instant Win” prize). If multiple Game Plays are received at exactly the same winning time, the Website will randomly select which of the Game Plays is the winning Game Play for that winning time. If you are an Instant Win prize winner, you will instantly see an on-screen message indicating that you have won (subject to verification) an Instant Win prize. If you are not a winner, the on-screen message will indicate that you may be eligible for a free exclusive DORITOS® Flamin’ Hot Nacho mobile or desktop wallpaper ("Wallpaper") to download. If you are an Instant Win prize winner, follow the instructions to add the prize to your account. Limit one Game Play/entry per person/household/Shopper's Card account per day (as defined above) across all banners. Instant WIn Prizes (7,500): a 9.75 oz bag of DORITOS® tortilla chips (ARV: $4.29 each). Total ARV of all Instant Win Prizes: $32,175.